Whole Foods Market in Mt. 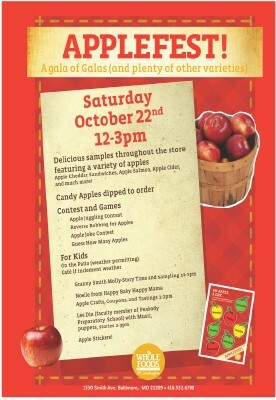 Washington is kicking off their Applefest on Saturday, October 22 from 12 p.m. to 3 p.m. They will selling made to order caramel apples, featuring and tasting apple cider, apple salmon, grilled apple cheddar sandwiches, apple pie, apple dumplings, apple nut butter sandwiches, apple bars, pumpkin ravioli with apples and lots more. There will be contests, games, kids activities on the patio, Granny Smith storytelling and samples, crafts, tastings, coupons, music and puppets.